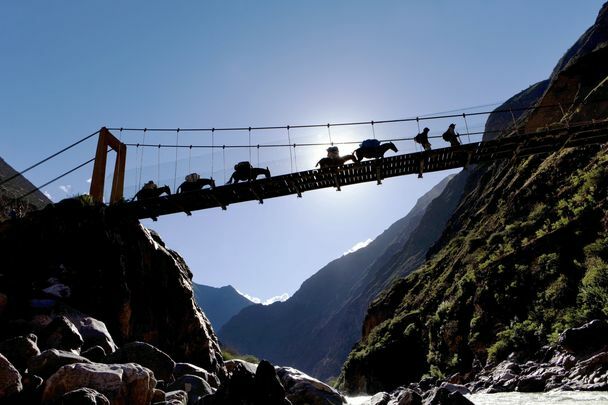 With the help from mules, an expedition team hikes across the Apurimac River to Choquequirao, an Incan citadel in south Peru. For now it’s a two-day trek to get there, but a tram will be built to whisk visitors to Choquequirao. The former mountaintop refuge of Incan royalty has elegant halls and plazas much like those of fabled Machu Picchu just 30 miles Yet only a handful of tourists visit the ruins each day, those willing to make a two-day hike to reach its majestic solitude. That is about to change: The national government has approved what would be Peru’s first aerial tramway. Bridging the deep canyon of the Apurimac River, it is expected to make Choquequirao reachable in just 15 minutes from the nearest highway. The 3-mile-long cable car will be designed to whiz 400 people an hour in each direction a half mile above the river. The president of the Apurimac state government, Elias Segovia, anticipates the $45 million tramway will bring about 3,000 tourists a day after it opens in late 2015. “This is going to generate tourist services. It will generate great investment” in hotels, restaurants and other amenities, he says. Currently, most visitors to Choquequirao must fly to Cuzco, the former Inca imperial capital, then drive four hours on mountain roads. Then it’s another 12 to 16 hours on foot. It’s little wonder Choquequirao (CHO-kay-keer-ow) gets only about five visitors a day. “When we went there it was the two of us and the two rangers,” said Jeff Widman, a 27-year-old Internet entrepreneur from Menlo Park, California, who trekked there with his wife, and continued on to Machu Picchu. Choquequirao, which means “cradle of gold” in Quechua, is believed to be the last refuge of Incan rulers who fled Cuzco after its leader Manco Inca was defeated by Spanish conquistadors. It is draped over the fold of a lesser mountain in the shadow of Salcantay peak, surrounded at 9,950 feet by steep precipices. Its buildings and irrigation canals meticuloushewedewn into rock are as well-preserved as those of Machu Picchu, its “top-of-the-world” views equally spectacular. David Ugarte, regional director of culture in Cuzco, predicts the tramway will open up to broader tourism not just Choquequirao but also other archaeological sites in the region. It is the first of 24 that President Ollanta Humala envisions building in each of Peru’s states to boost tourism. “But as long as the government manages (the tramway) properly, I think it can bring some good into the area,” said Kalitsis, whose company organizes treks to Choquequirao. Peru’s Housing Ministry and Apurimac’s regional government are about to begin taking bids for construction. Companies from Switzerland and Andorra have already expressed interest.